Vehiclesplay a major role in many MetaCyber campaigns. GM's can always write up a futuristic vehicle themselves, but might as well save a little time and "borrow" from the resources available. 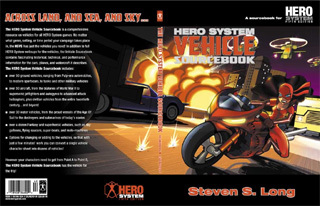 The HERO System Vehicle Sourcebook (HSVS) uses the ideas set forth in The Ultimate Vehicle (TUV) so GM's might want to check that out first. In addition to the Ground Vehicles from TUV, the HSVS gives us a much broader selection to choose from. All of the vehicles in this section have equivalents in a MetaCyber campaign. Automotive technology has advanced of course, but most of the advances come in the form of fuel efficiency, power, comfort, and amenities. Hovercraft technology in the form of SkyCars (see below) is on the rise and will eventually supplant conventional vehicles, but wheeled ground vehicles are still the mainstream standard due to a combination of a lack of strong government to legislate transporation and highway reform, and a lack of a need to innovate in an already profitable area. To make the vehicles feel more advanced a GM could just pump up the movment a bit, and assume that the onboard saftey features are more advanced. Also, in more expensive vehicles, luxury and comfort items such as a onboard computer with Autopilot, Tri-vid projector, database of music and movies, and advanced geo-positioning and communication capablities are available (at extra cost). The MagLev is the standard form of ground based mass transit in some areas of the world; the technology is about 20 years old in the MetaCyber setting, and most MagLevs and related facilities have a grimey, public transit pall over their original shiny coolness. Typically, in the fractured former United States MagLevs within a splinter nation run freely between their own cities, but lines that run to other splinter nations are seperate systems and are policed or restricted in some fashion. In addition to the Air Vehicles from TUV, the HSVS gives us a few more options. This Skycar writeup is used as the basis for a wide variety of personal hovercars in the MetaCyber setting -- essentially the equivalent of a flying sedan -- from a wide variety of manufacturers. Though still high, the price tag has been coming down on the models of the last decade, ensuring that this is no longer technology only enjoyable by the ultra rich. Comfortable but not filthy rich people like mid level corporate salarymen, trust fund types, and moderately accomplished Runners can afford them now. Advances include better fuel economy (extend Fuel Charge), autopilot features (add Computer), improved speed (up flight speed), and better manuevering (use the Sideways Manueverability Advantage on page 15 of The Ultimate Vehicle supplement). Military versions include a bullet proof awning and up to DEF 10 armor plating (but are slower, or have a greatly reduced operating range, or some combination of both), as well as one or more weapon systems. This sort of "vehicle" exists in the MetaCyber campaign and are heavily used by Sec Forces, military forces, spies, and Runners. Numerous role-appropriate variations exist. Helicopters see a lot of use in the MetaCyber campaign, and any of the modern versions provided can be used as such; similar to the advice given above for Ground Vehicles any innovations can be reflected with enhanced perfomance and safety features if desired. SkyCar technology is slowly but surely creeping up on Helicopters though, and it wont be long before someone develops a larger SkyCar type vehicle that is able to perform most if not all Helicopter roles such as cargo lifting. In the meantime Helicopters' incredible flexibility, reliability, and practicality ensure that they continue to be made and used. Similar to the SkyCar, Air-Cycles were once the balliwick of the superrich and elite military units, but their prices have dropped over the years until they are now attainable by succesful middle class people. The write up on page 143 illustrates a military version (which is very suitable to Runners), but a toned down version with a reduced handling profile (SPD 3) and without the blasters is commercially available from a variety of manufacturers. They are hideously dangerous of course as most accidents on them are fatal, but many a Cyborg got borged up after an Air-Cycle accident they narrowly survived, making for a decent origin for some Runners. Obviously this write up on page 144 can serve as an excellent basis or even be used as is for all sorts of Urban Assault vehicles. Runners, Sec-Forces, and military / paramilitary all use them. Most Drivers have at least one Battlevan that they spend a lot of time and effort tricking out and maintaining. This represents the current cutting edge for personal flying craft in the MetaCyber setting. The technology is not yet efficient, and is not favored by the military so development on it is slow. The Quicksilver Sparhawk and the Strucker Strahluft are the main competitors for the wealthy jetsetter crowd. Veloci-Tek and Yamamoto are trying to break in to the market. However several ultra wealthy individuals have them, and a few corporations with a taste for flaunting their power use corporate owned JetCars as perks for top executives. Since the two products are similar and the SkyCar is further along in its development, the JetCar many never become prevalent. It's still worth bragging rights though, and thats enough for some people. Minus the blasters this write up is a good base for motorcycles in general in the MetaCyber setting. With the blasters it is ideal for use by Runners, Sec-Forces, and military units.